Not a browser issue, so moved to Feedback. 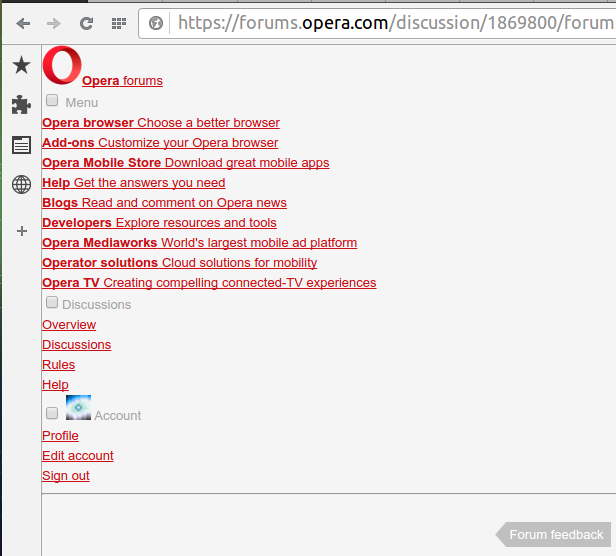 Right, https://forums.opera.com/post/89595, checked in all browsers now. All day long and still no fix? This is not very reassuring. And the smilies are half-broken. There are bugs bugging around for some significant time already - I was even thinking about opening such a thread, "Where are the Site Developers?" Perhaps, they've been drinking a lot since... No idea, right. Damn! the smilies are bugging a lot! Most of the smileys are done by picking a block out of a single large sprite, to save downloading time. Hence if one is gone, they all are. We do have Smiley's Store in any case!